Just ahead of its Model 3 sedan release, Tesla has announced that it will double its charging network by the end of this year. The electric car maker says it will have over 10,000 Superchargers and 15,000 Destination Charging connectors around the world by end of 2017. In the U.S. and Canada, the number of Superchargers will increase by 150%, while in California alone, the company will add over 1,000 Superchargers. In addition to growing its charging network, Tesla also plans to expand its existing sites by broadening its charging locations within city centers. 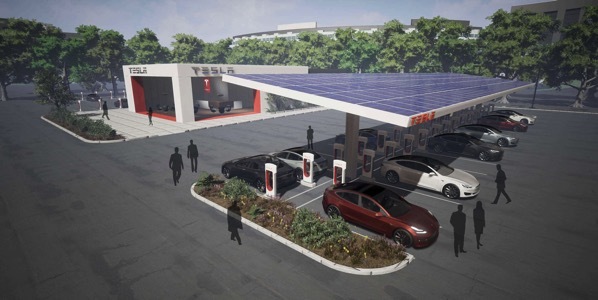 The company will build larger sites along the busiest travel routes that will accommodate several dozen Teslas Supercharging simultaneously. In addition, many sites will be built further off the highway to allow local Tesla drivers to charge quickly when needed. We’re moving full speed on site selection and many sites will soon enter construction to open in advance of the summer travel season. Tesla’s complete Supercharger map and network expansion plans are available at this link.